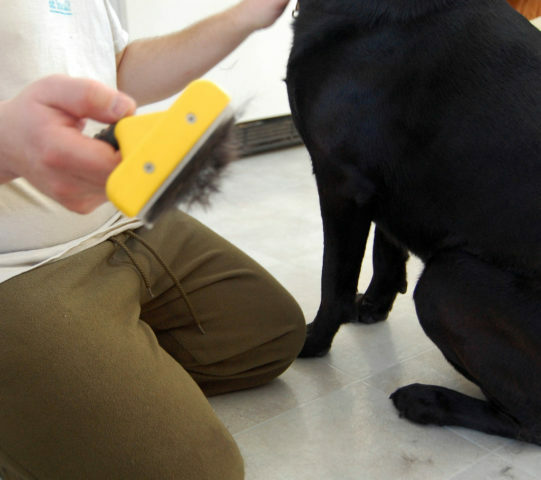 I’ve been using the Furminator deshedding tool for dogs for years now. I love it. And my dog actually likes being brushed! We’ve been using the large size (yellow handle) Furminator on my 90-pound Black Lab / Great Pyrenees mix. This is the original model that started all the rave reviews about the Furminator for dogs. 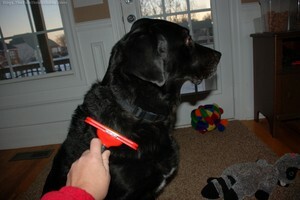 I was thrilled when the folks at Furminator recently sent me a giant size (red handle) Furminator. It’s the newest addition to their line of Furminator deshedding tools. This one is much larger, more ergonomic, and it has a “fur ejector” button to easily remove the pet hair that collects in the teeth of the brush itself. #1 – Not only is the handle larger (and better for larger hands), but it’s also more ergonomic. The original Furminator has a very straight handle which works, but it feels a bit awkward in your hand while you’re doing the brushing. This one is curved in all the right places. #2 – Another great feature with the newest Furminator dog brushes is the “fur ejector button” that you depress each time to remove all of your dog’s fur from between the individual tines. 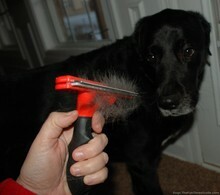 This button now makes the Furminator a cinch to use and a cinch to remove all of the hair! If I were going to buy a Furminator deshedding tool for the first time, I would definitely try to get one with the FURejector button. That said, you can probably get a good deal on Furminators that don’t have that button right now. My guess is that many will be upgrading to the newest version for the fur ejector button alone. #3 – The absolute best feature that is found with all of the Furminator deshedding tools is the fact that this brush removes the undercoat that is responsible for all of the flyaway fur that you find stuck to your sofa and on the floor in the corners of each room. So no matter which Furminator tool you decide to try, you can rest assured that it will be the last dog brush you will ever need to buy! It’s extremely durable and solidly built. There are no fragile parts to wear out or break. It’s a single-purpose dog tool that serves its purpose extremely well. Don’t miss my original list of Furminator pros and cons!